These days, there is a pair of headphones for virtually every purpose. You can get headphones that block out the world, helping you get more into your music. Alternately, there are bone conducting headphones that let you enjoy your music without separating yourself from the outside world. This is an important concept when you’re commuting via bicycle or hanging out in a room where you want to be in touch with people. Whether it’s safety or your social life, we can’t afford to be isolated all the time. LG has an interesting solution for this problem. 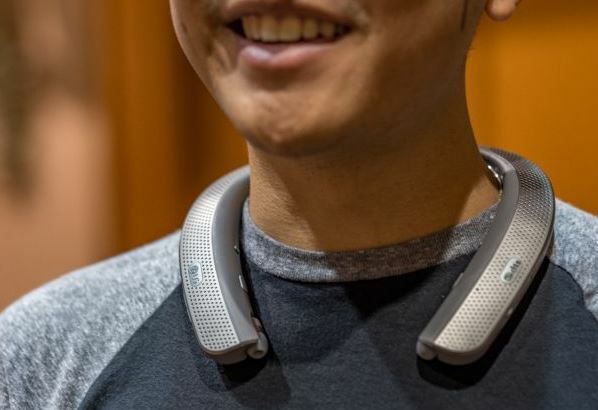 With their Tone branded “wearable personal speaker,” they’ve taken their design from the lanyard style headphones and complimented the earbuds with a high-performance speaker. How does it perform? We went hands-on to find out. 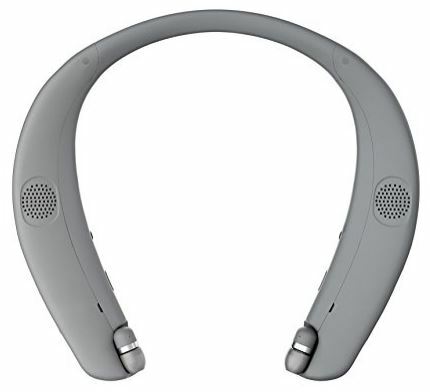 With a very sleek metal finish, the LG TONE Studio HBS-W120 is unlike any Bluetooth models we’ve reviewed before. 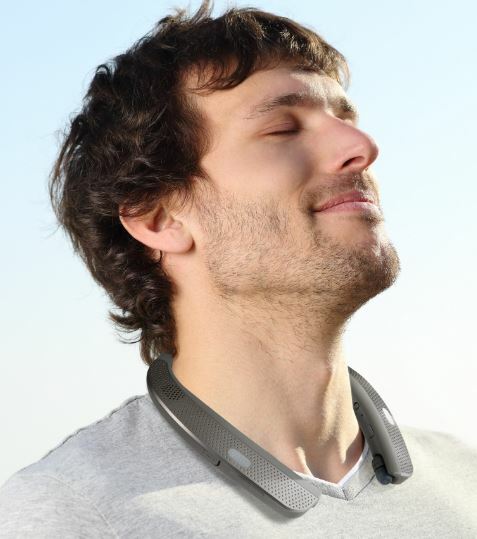 It’s designed as a neckband, designed to be worn by whoever wants to enjoy it. There are two ways you can use this. 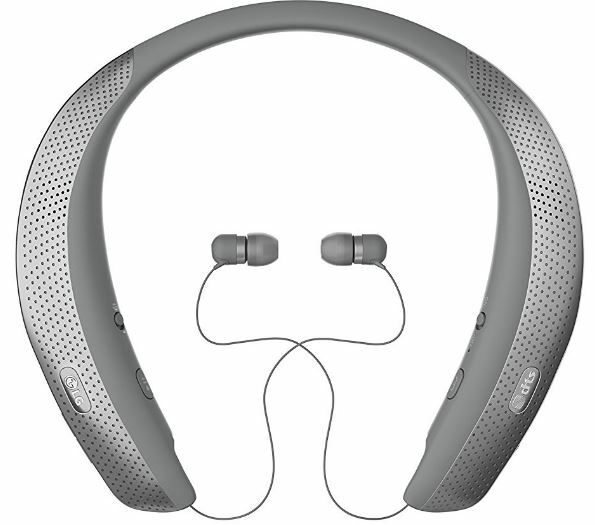 You can extend the retractable cables to plug into the in-ear headphones. Or, you can use it in speaker mode, with the sound playing from the large speaker grills and filling the room around you. While this bands-style headphone is a little larger than LGs earbud-only options, but considering the quality of the speaker included, the additional size is well worth it. This audio device looks a bit like a boomerang. At first glance, it can seem like it would be a little uncomfortable. But once you hold it in your hands, you’ll realize that there are a number of intelligent design features that really make its shape work. The rear part of the band is made from a flexible rubber. This makes it easy to put on or take off, and adds a high level of comfort. The large speaker grill covers most of the left and right bands, but this isn’t just for show. There are two drivers on each side, allowing it to produce a full range sound. The earbuds themselves are wired, but the wires are retractable. When not in use, they slip up inside the case, tucked away for when they need them. There are also several buttons and ports located around the speaker. On the left, you’ve got a covered micro-USB port at the top. This is used for charging, and can work with any standard phone charger. Below that, you’ve got a rocker switch that turns the volume up or down. On the inside, you’ll find a single switch that selects between speaker mode and earbud mode. Last, but not least, there is a button on the bottom that allows you to answer calls or play / pause the music. Because there are two different audio sources in this device, we’ll have to review each of them separately. Creating compact speakers is a bit of a challenge, so we expected to find some limitations. Instead, we found that this speaker performs much better than we had anticipated. As we mentioned there are two separate drivers on each side. This creates stereo sound. With most Bluetooth speakers being mono models, stereo is a nice bonus. Because the bass and the treble and divided up between two separate drivers, there is very little distortion in the sound. While it’s not as bassy as a full size speaker, it’s still very clear and easy to listen to. Clarity is really the one areas this speaker excels. For this reason, we’d highly recommend it to anyone who wanted something to use for gaming or enjoying multimedia. But even when used for playing music, the sound quality is still above average. Instruments maintain their tonality, and the presentation has a very peppy, lively feel to it. The drivers are oriented to get full, 360-degree coverage around your head. This helps create a large soundscape, making it feel as if you’re listening to a much larger sound system. Another added benefit for games and music is the Dolby DTS encoding. This is a style of audio that is very commonly found in movies, and makes the sound much more cinematic in feel. Generally, you only find DTS decoders on full size home theater systems, so having access to this technology in a portable package is game-changing. If you’re gaming or commuting, the speaker would be a great choice. But there are always those times when you want to just tune out and enjoy some music privately. Just like with LGs other earbuds, these ones are very high quality. You definitely get much more bass, as is to be expected from in-ear earbuds. Music is loud, powerful, and crystal clear. 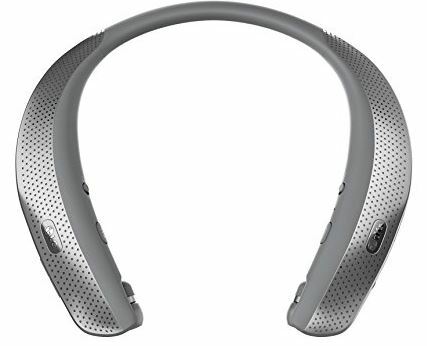 LG provides a very forward sounding presentation, ideal for engaging, active music. Perhaps it’s due to the higher power amp driving these earbuds, but we definitely felt that these headphones had more power than we were used to. If you’re the type of person who likes to listen to get up and go music, you’ll definitely be impressed with these earbuds. This isn’t a first-generation unit, as LG has been tweaking and improving the design for quite some time. One of the coolest features they’ve added is the ability to pair these portable speakers together. If you want to share your music with a friend, or watch a movie with somebody, you can connect two of these together and both enjoy the sound at the same time. Another feature that’s been added is haptic feedback. Have you ever gone to a concert and seen those giant bass bins in the front? These speakers generally produce audio between 10 and 20hz. This is below the audible range, but produces a vibration that you can feel. This is what gives a concert that powerful kick. The same type of technology is built into this speaker. The drivers are designed to create vibrations that you can feel, which really improves the level of involvement you feel in your music. Another impressive improvement is the battery life. In speaker mode, you’re able to enjoy 6 hours of on-the-go music. In earbud mode, you get a whopping 35 hours. Considering the size, these are pretty impressive figures. If you’re going to be using this for phone calls, you can get up to 40 hours of talk time on it, since this only uses one of the four drivers to conserve power. If you really want to take your experience to the next level, there are a few helpful options available. Since the earbuds are much cleaner sounding then most, LG has included “velvet sound” to give you more of an audiophile experience. In essence, this allows you to go beyond the compression issues of Bluetooth. The digital amp is designed to accommodate up to 32-bit audio in the earphones, and 24 bit for the speaker. You can get this quality audio if you’re using an external DAC, something that most audiophiles will already have on hand. Alternately, there is a built-in equalizer available. This allows you to choose from one of several pre-configured presets that improve the audio in specific ways. You can choose from different musical styles, to settings like “movie” or “speech.” Overall, this was a nice feature to include. The one downside to all of these features is the size. If you’re looking for a highly portable pair of earbuds, you might be more interested in the LG Tone Pro HBS-760. These earbuds are very similar in design to these, but without the included speaker. For those who will only occasionally use the speaker, it might be easier to buy those and a separate Bluetooth speaker for those occasions. These days, it seems like so many Bluetooth speakers are designed for large groups. For that reason, it was refreshing for us to try out this LG model that was clearly designed with personal audio in mind. If you spend a lot of time on your bike, this style of speaker is a great way to enjoy some music without putting your safety at risk. It’s also a great alternative for a gaming headset, as the built-in microphone is very high quality and the Dolby DTS creates a very engaging audio experience. This isn’t LG’s first shot at this style of portable speaker, but there are so many improvements on this model that this is the first time we’d highly recommend this one. If you’re on the market for a unique way to enjoy your music, we highly recommend giving the LG TONE Studio HBS-W120 a shot.